By David J. Ballard, MD, PhD. 180 pages | 39 B/W Illus. Achieving health care that is safe, timely, effective, efficient, equitable, and patient-centered (STEEEP) is not an endpoint, but a journey. This journey requires a commitment to quality improvement (QI) from the highest levels of leadership combined with the interdependent development of several key components of health care delivery: administration and governance, clinical leadership, quality programs and expertise, data analytics, and accreditation. As each organization travels along its journey, these components must evolve at a common pace. With each component of a given phase of the quality journey firmly developed, the organization can expect to advance to the next phase knowing that the requisite factors are aligned. Baylor Scott & White Health (BSWH) has formalized its commitment to quality with the adoption of the STEEEP framework supporting the Institute of Medicine's call for health care that is safe, timely, effective, efficient, equitable, and patient centered. This Shingo Prize-winning guide book is a companion to BSWH's recent book Achieving STEEEP Health Care. It presents practical approaches and tools, including sample workflows, forms, charters, and checklists, that health care delivery organizations can use to organize, lead, execute, and measure the impact of their own improvement efforts. BSWH has traveled the QI journey during its 100 years as the largest not-for-profit health care system in Texas and one of the largest in the U.S. With a history of visionary care, its aim is to help others achieve the highest levels of quality and safety for their patients. To learn more about the BSWH quality journey and to find additional case studies and tools, please visit www.steeepglobalinstitute.com. "For quality leaders who are wondering what to do and how to do it – this book provides the detail that you have been seeking, right down to the level of the types of people to hire, what their qualifications should be, where they should fit in the governance chart, and the nature of their deliverables." —Thomas H. Lee, MD, Chief Medical Officer, Press Ganey Associates, Inc.
"Organizations that can reliably and effectively implement best practices will be leaders in the health care field in the 21st century. This book is a gold mine of practical and valuable resources and tools for health care organizations to use today and for years to come in their improvement journeys." "Baylor Scott & White Health has again provided a road map, this time exceptionally documented and annotated. This effort will assist health care institutions in consistently improving the care provided to their patients. In today's ultra-competitive world focused on the right care at the right time in the right setting, Baylor Scott & White Health’s second effort is a must read. It provides both the rational and in-depth tools to transform an organization into a world-class provider of safe and efficient health care services. Combined with strong patient and family participation, it offers the road map to substantially improved patient satisfaction, staff retention and community endorsement. Kudos to Dr. Ballard and his team—a clear, clean and crisp presentation." "Baylor Scott & White Health's journey to improve health care guided by the Institute of Medicine's STEEEP aims serves as a role model for all of us in health care. But then comes the hard part -implementation. The practical, well-organized suggestions contained in this guide, harvested from the organization’s real-life experience, are an invaluable resource for others considering a similar journey. The guide is helpful for anyone, novice or expert, who is helping to lead large-scale clinical change in today's challenging health care environment." "Achieving best clinical outcomes at lower costs, while creating an ideal patient and provider experience, requires a set of intentional structures and processes. Dr. Ballard and his team have developed the 'how-to manual.'" 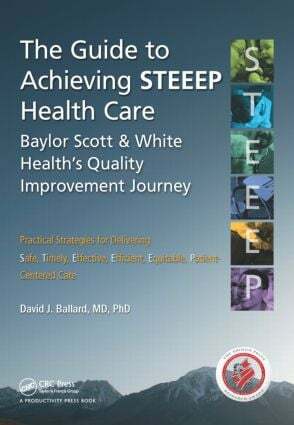 "This guide to achieving STEEEP health care lays out a very practical approach to patient safety and quality improvement based on the extensive experience of Dr. Ballard and his team. The practical examples included in this guide are a goldmine of useful approaches for any healthcare system wondering where to start or how to take the next step in their journey. This companion to the earlier book should be welcomed by many waking up to the importance of driving change in the delivery of care at the present time." "… includes a plan consisting of four phases for health care providers to follow when trying to achieve STEEEP care. Numerous real world examples and extensive appendices that include everything from checklists for success to sample learning boards are provided." Introduction. Elements of the Quality Journey. Phase 1 of the Quality Journey: Initiation. Phase 2 of the Quality Journey: Foundation Building. Phase 3 of the Quality Journey: Operationalizing. Phase 4 of the Quality Journey: Continuous QI. David J. Ballard, MD, MSPH, PhD, FACP, is senior vice president and chief quality officer for the Baylor Health Care System (BHCS), Dallas, Texas; executive director of the BHCS Institute for Health Care Research and Improvement; and president and founder of the BHCS STEEEP (safe, timely, effective, efficient, equitable, and patient centered) Global Institute. Under his leadership, BHCS has received many awards for health care quality improvement, including the 2010 Medical Group Preeminence Award of the American Medical Group Association, the 2008 National Quality Healthcare Award of the National Quality Forum, and the 2007 Leapfrog Patient-Centered Care Award. Prior to joining BHCS in 1999, Dr. Ballard held progressive academic appointments as assistant and then associate professor at the Mayo Medical School, associate professor with tenure at the University of Virginia School of Medicine, professor of medicine in the Emory University School of Medicine, and professor of epidemiology in The Rollins School of Public Health at Emory University. He also served as founding head of the Mayo Section of Health Services Evaluation, founding president of the Kerr L. White Institute for Health Services Research (1991–1999), president (2001–2003) of the International Society for Quality in Health Care, and chair of the Agency for Healthcare Research and Quality (AHRQ) Health Care Quality and Effectiveness Research study section (2006–2010). He currently chairs the AHRQ’s Centers for Education and Research on Therapeutics Steering Committee (2013–2014). Dr. Ballard serves on several editorial boards of peer-reviewed medical journals, including Health Services Research, the Journal of Comparative Effectiveness Research, and the Mayo Clinic Proceedings (for which he serves as Health Policy section editor). He has published over 200 articles and is the 1995 recipient of the AcademyHealth New Investigator Award, which is given annually to the outstanding health services research scholar in the United States less than 40 years of age. His research also received the 2012 John M. Eisenberg Article-of-the-Year award from Health Services Research. He is a member of the UNC School of Public Health Foundation Board and a past member of the Board of Trustees of the Texas Hospital Association. A board-certified internist, Dr. Ballard trained at the Mayo Graduate School of Medicine following completion of his MD, MSPH, and PhD in epidemiology, and BA in chemistry and economics from the University of North Carolina, where he was a Morehead Scholar, North Carolina Fellow, and junior year Phi Beta Kappa inductee. In 2008, Dr. Ballard received the Distinguished Service Award from the UNC School of Medicine.